ECHINODERMATA : ASPIDOCHIROTIDA : Holothuriidae STARFISH, SEA URCHINS, ETC. 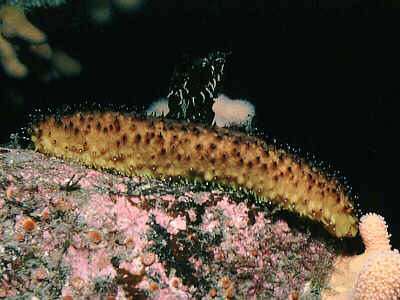 Description: A common large epifaunal sea cucumber. Colour is variable, usually black but sometimes with yellow mottling especially on the underside. The dorsal papillae may be white-tipped. The animal will readily eject white threads, the cuvierian organs, from the rear end if molested, hence the common name "Cotton-Spinner". The spicules are very small and rare in the body wall. To 30cm length. Habitat: Lives in rocky sublittoral habitats with considerable wave exposure. Distribution: Common in rocky sites around SW Britain and on the west coast of Ireland. Very local on the west coast of Scotland. Similar Species: Several other species of Holothuria are known from the French Atlantic coast and could possibly turn up in southern Britain. 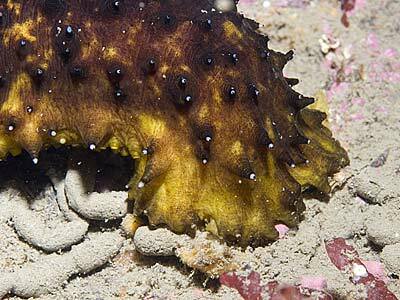 Large sea cucumber with short deposit-feeding tentacles. Picton, B.E. & Morrow, C.C. (2016). Holothuria forskali Chiaje, 1841. [In] Encyclopedia of Marine Life of Britain and Ireland.